From egg to flying bird in 13 days! This spring we have had blackbirds build a nest on our window sill. It is mind-numbing how quickly baby chicks grow. 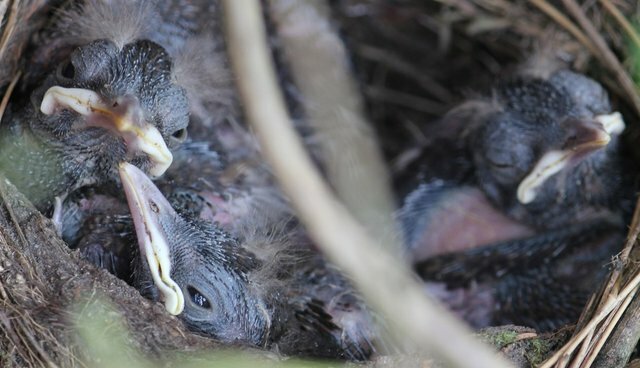 With blackbirds it takes just 13 days, from the tiny slug the size of a raspberry that cracks its way out of the egg to the fully-fledged aviator ready to fly and take on the world. We have had the privilege of seeing it all happen through our bedroom window. It is a process not without its costs. You only have to watch the parents run ragged; up at 4 a.m. and busy catching slugs, etc., right the way through 'til 10 p.m. I filmed this nest last year, but we have had the same birds this year, just a little further down in the honeysuckle. The parents have been flying in and out for ten weeks now. At first we thought "Ah-ha, they're having a second brood" ... then, "OK, there's probably a cuckoo in the nest" ... and, finally, "My god, whatever is in there must be huge!". Any day now I expect to wake up and find the honeysuckle peeling away from the wall to reveal a bemused ostrich perched on its tiptoes in a tiny nest. Beside it lie two bedraggled and shagged out blackbirds gasping for breath.